A cake is the only food you can cut on with happiness and everybody rushes to get a piece of it. By having a bite of this Divine Butterscotch Cake, you can't stop yourself to demand it for next time. This yummy creamy butterscotch cake sure to win the heart of your loved ones and make them happy. It can be the attraction of your celebration, be it a Birthday, Anniversary or Christmas. 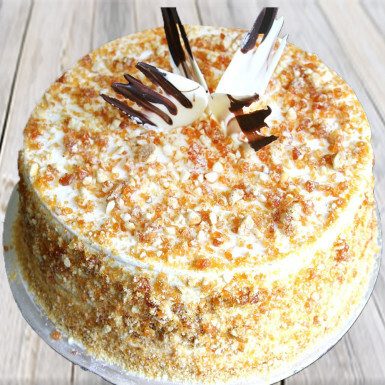 Share this amazing delight with your family, friends and relatives by ordering this Divine Butterscotch Cake from Winni. Order now! ordered this for my friend in kolkata...he was really happy with the cake and liked the taste of it...so kudos to you guys for great service ! !